Most of the time, the files you synchronize are produced by applications. And if the applications are still running, you shouldn’t synchronize because the files may still be locked. 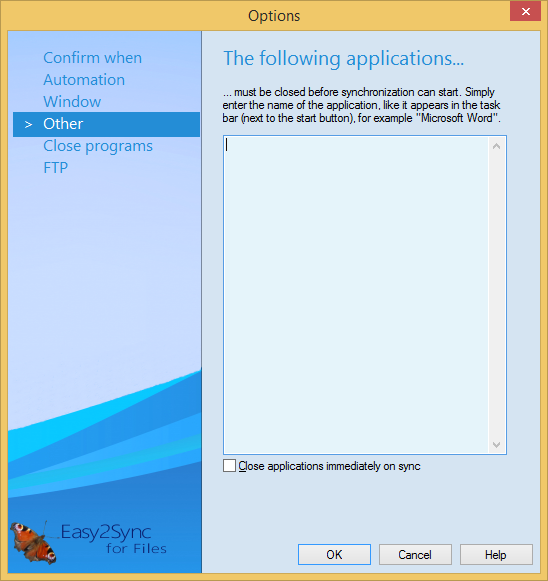 Therefore, you can tell Easy2Sync to warn you if certain applications are still running when the synchronization process starts. For this, just enter the name of the application as it appears in the task bar (next to the start button). If the task bar contains not only the application name, but also the current filename or something else, it is enough to enter the application name, for example ”Microsoft Word”. The options on this page are not supported for services. Close applications immediately on synchronization: If you activate this option all the applications in questions will not simply be listed, but also closed when the synchronization is started.